The Washington Traffic Safety Commission partnered with Creative Media Alliance to promote its statewide motorcycle safety campaign, “It’s A Fine Line,” and ItsAFineLine.com. CMA provided responsive website design and development, search engine marketing, branding services, and social media marketing to grow WTSC’s program. 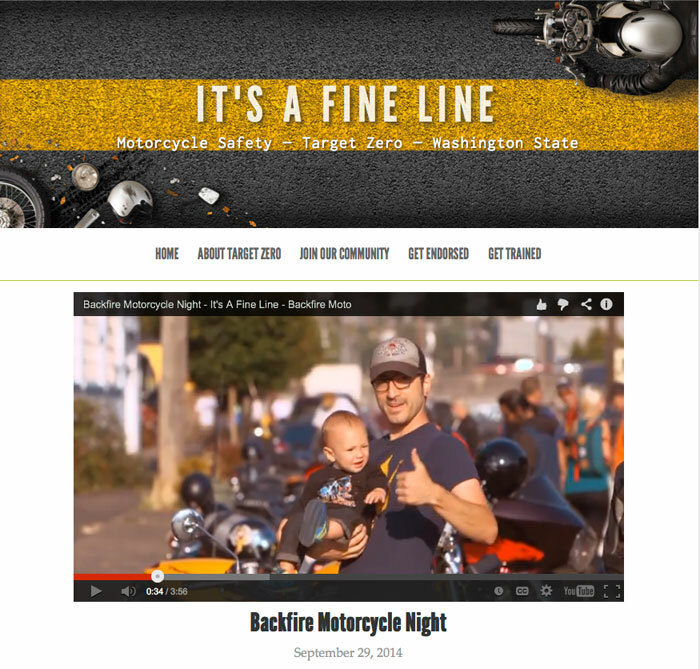 CMA web designers created ItsAFineLine.com, a mobile-friendly, video-based website that draws Washington motorcycle enthusiasts from all walks of life. Users can easily view and share videos and stories about events, rides, clubs, gear, and especially motorcycle safety and training. During website development, CMA graphic designers also produced print advertising, postcards, and truck-wraps for “grass roots” marketing. The designs were also incorporated into online search engine marketing (Google AdWords) and social media promotion (Facebook, Twitter, YouTube) for unified branding, messaging, and rapid community growth. With the help of CMA social media marketing, IAFL’s Facebook “likes” and social engagement skyrocketed in a few short weeks. The campaign’s Facebook, Instagram, Twitter, and YouTube communities continue to expand, thanks to targeted content and promoted posts that draw interested, excited fans from across the state. Finally, CMA’s Seattle video production department filmed more than a dozen videos to seed the content of ItsAFineLine.com. Many of these videos are biker testimonials from local motorcycle track days, where motorcyclists can hone their riding skills and safety protocol at different speeds on an isolated track. Other action-packed videos included Backfire, a marquee Seattle motorcycle gathering, and the signature video for Target Zero: Motorcycle Safety. CMA also leveraged curated video content from YouTube’s active motorcycle community. The goal of It’s A Fine Line and the WTSC’s umbrella campaign, Target Zero, is zero motorcycle deaths by 2030. The WTSC and CMA created It’s A Fine Line as an online community where motorcyclists can come together to support safe riding through increased awareness and training. It’s A Fine Line between the best ride of your life and the last ride of your life. Together we can save the lives of our friends, our families, and our community.